The entire pool, including a carryover jackpot, will be paid out to all those holding tickets with the most winners. Should the Rainbow 6 remain unsolved Friday, a pool of several million dollars is expected be up for grabs. (There will be a mandatory Rainbow 6 payout Saturday even if the jackpot is hit Friday, with the pool measuring $1,413,193 entering the card). 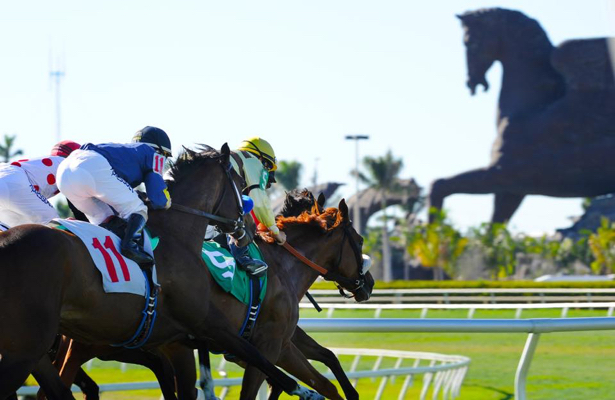 The Rainbow 6 sequence will span Races 7-12 on Saturday’s card and will feature the $100,000 El Prado in Race 11. Turf Stable, LLC’s Mr. Cub and Three Diamonds Farm’s Hembree headline the 13-horse field for the 7 ½-furlong turf stakes for older horses. The El Prado will be preceded on Saturday’s card by a 1 1/16-mile optional claiming allowance for 3-year-olds in Race 10. Sagamore Farm, LLC and WinStar Farm, LLC’s Global Campaign, a most impressive debut winner at Gulfstream Jan. 5, is set to return to action. The son of Curlin captured a seven-furlong maiden race by a going-away 5 ¾ lengths while wrapped up by jockey Luis Saez.